Brooks Koepka continued the red hot form from his US Open win at Royal Birkdale. 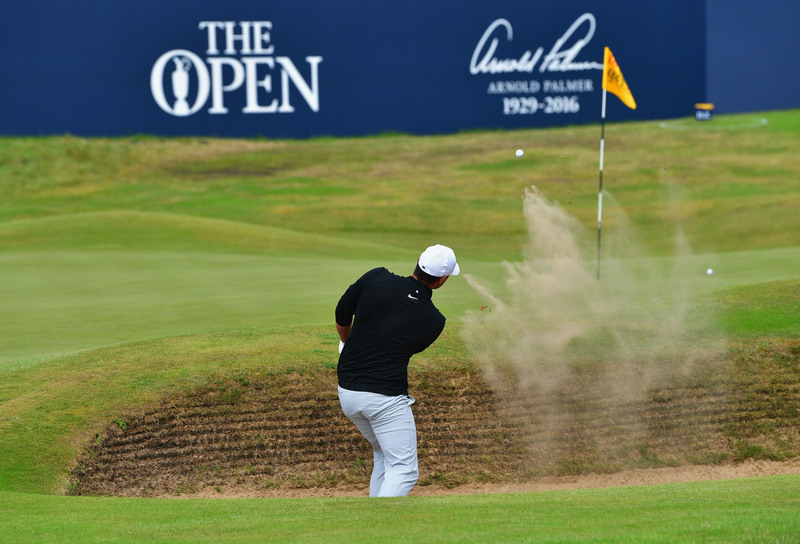 Jordan Spieth and Brooks Koepka, the red-hot future of US golf, seized the lead of the 146th Open Championship dragging veteran Matt Kuchar along for the ride as the stars and stripes dominated day one at Royal Birkdale. The younger pair both won their final tournaments before landing in Lancashire – Koepka’s being the last major, the US Open at Erin Hills – and shot five-under 65s in the tougher conditions of the morning play. Kuchar latyer joined them after following a surging five-under 29 on the front nine with nine straight pars on the back in the easier weather of the afternoon. With strong winds and rain forecast for all tomorrow’s plays, the trio have a narrow one stroke lead over England’s Paul Casey and South Africa’s former Masters champion Charl Schwartzel. A resurgent Ian Poulter and Scottish Open champion Rafa Cabrera Bello from Spain are just two off the lead in what is predicted to be the best day for scoring at Birkdale this weekend. Rory McIlroy had plunged to five-over after six before a pep talk from caddie JP Fitzgerald saw him rally for a 71, still six shots off the pace. Scots Richie Ramsay and Martin Laird are just three shots back.